ROME - Italian train operating company Trenitalia has signed a partnership agreement with Emirates airlines in an effort to develop synergy between the two companies. The move brings Italy and the United Arab Emirates "closer" by helping to develop business and tourism in Italy, according to a press release issued by Trenitalia. 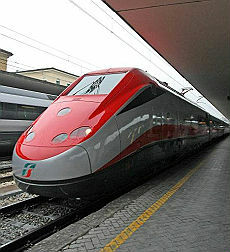 As part of the agreement, passengers of Emirates airlines will be offered reduced prices for same-day travel tickets on Italy's high speed trains when arriving in or departing from Rome, Milan, or Venice. The partnership will also allow members of CartaFRECCIA, Trenitalia's loyalty rewards program, discounts on air travel with Emirates. Members will receive a seven percent discount on Emirates flights when they travel in First or Business class. They will also receive a five percent discount when travelling in Economy class. Emirates will also publish special rates in a magazine given exclusively to CartaFRECCIA members. The companies hope that these "strong incentives" will show loyal customers the synergy between train and air.